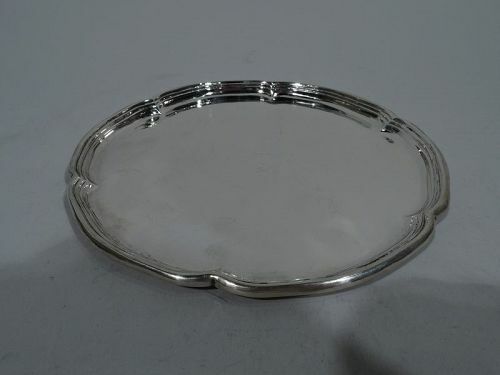 Craftsman sterling silver calling card tray. Handmade by Arthur J. Stone in Gardner, Mass. Round with reeded and lobed rim. A nice piece by the historic New England smithy. Fully marked including silversmith's initial C for David Carlson (1909-1919) or Magnus Carlberg (1922-32). Very good condition. 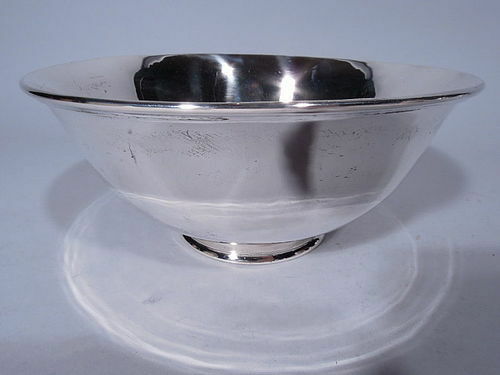 Craftsman hand-hammered sterling silver bowl. Made by Arthur Stone in Gardner, Mass. Curved and tapering sides and stepped inset foot. Hallmark includes silversmith’s initial U for Earl H. Underwood, who was active from 1921-7. Very good condition with nice shimmer. 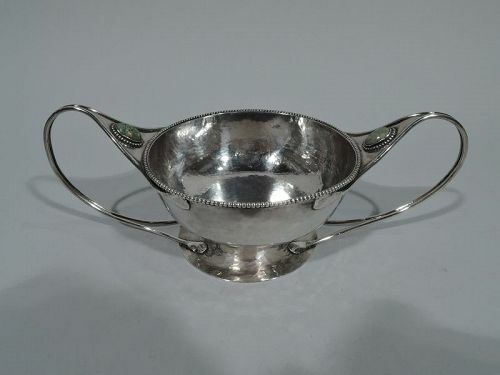 Hand made sterling silver bowl. Made by Arthur Stone in Gardner, Mass. Curved and tapering sides and stepped foot. A beautiful piece in the Craftsman tradition. Hallmark includes benchman’s initial G for Herman W. Glendenning, who was active from 1920-37. Fine condition and patina. 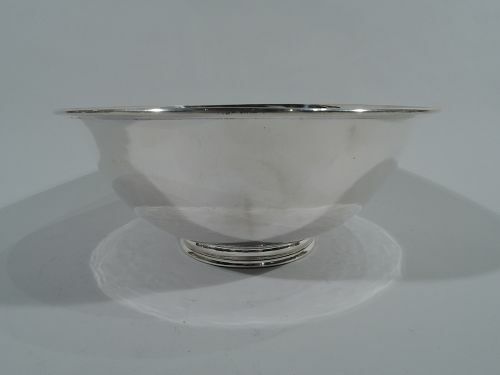 Sterling silver bowl in form of apple. Made by Federico Buccellati in Milan. Allover stippling, suggestive of the irregular skin. Contrasting veined leaves and stem. 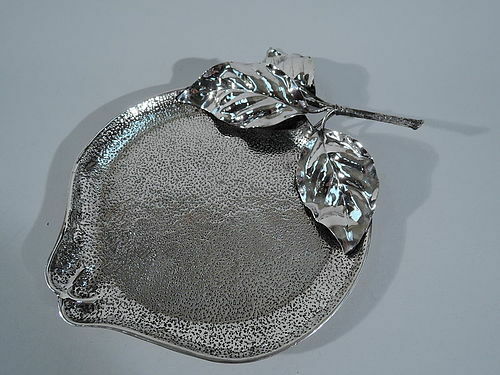 A beautiful piece by a maker with a figural fruit tradition. Hallmarked (1968 to present). Condition: Fine form and rich patina. 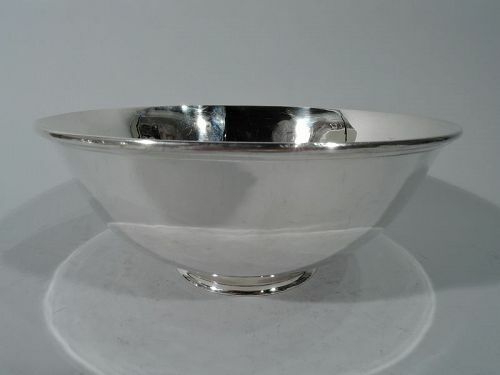 Hand-made sterling silver bowl. Made by Stone Associates in Gardner, Mass. Curved sides, molded rim, and stepped foot. Hallmark (ca 1938-57) includes craftsman’s initial C. Very good condition and patina. 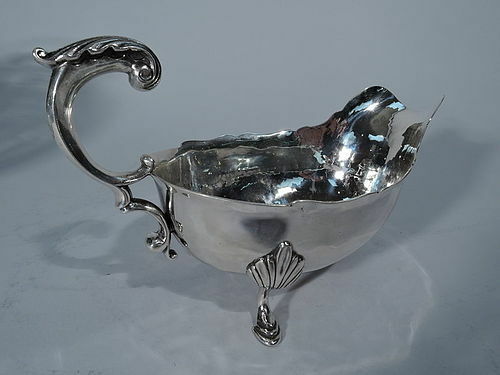 Sterling silver gravy boat. Made by William G. DeMatteo in Bergenfield, New Jersey, ca 1950. Ovoid and curved body with scrolled rim, wide lip spout, double-scroll flying handle with leaf cap, and 3 hoof supports with shell mounts. Visible hand hammering. Thoughtful and conscientious Georgian Revival. Partial hallmark with phrase “Sterling Hand Made”. Very good condition and patina.